Years in the making at different studios, Ubisoft's I Am Alive brings the Xbox Live Arcade "House Party" to a close with a post-apocalyptic bang. A story of survival, it's full of ideas and twists on the action-adventure conventions we've grown used to. It's also yet another ambitious title in a recent string of games that tries to make us rethink what to expect from studios in the downloadable space. It's been roughly a year since "The Event," a massive catastrophe that has destroyed civilization. Earthquakes and volcanic ash hint at a natural disaster, but nobody is left to explain what caused it. Cities across America lie in ruins, all color removed from the world by layers of ash and dust, and those who were able to flee during the chaos have done so. What is left of urban civilization is a bleak, harsh environment where a tribal gang culture has emerged from the ashes, and a dog-eat-dog mentality prevails above all others. I Am Alive's everyman protagonist finds himself at the edge of Haventon, his hometown, visibly scarred from his survivalist trek to reach his wife and daughter, whom he hasn't heard from since The Event. He is a man with a singular purpose, but also a man who hasn't forgotten what it means to be human. It doesn't take long before you are sidetracked from the quest to find your family. You encounter a little girl in need of help, and a mysterious voice on the radio by the name of Henry wants you to bring her to safety. Thus starts a chain of events that sees you running, walking, coughing, climbing, slashing, and shooting your way all over Haventon to find the last remaining safe camps where your family might be hiding. 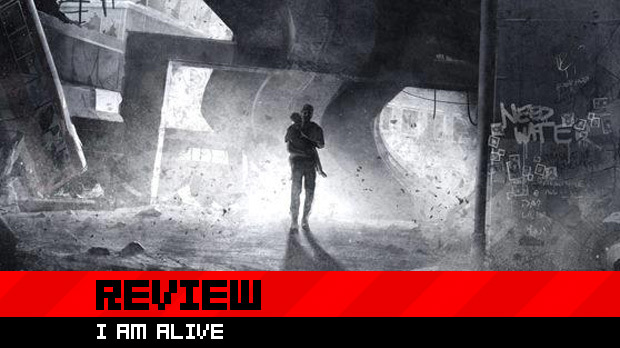 For the most part, I Am Alive delivers on its promise to bring to life a true survivalist's adventure in a world gone to hell, both in terms of gameplay mechanics and how it conveys an oppressive atmosphere of hopelessness. Objectives offer a linear path, which can often be deviated from in favor of risky exploration. Health doesn't regenerate, and must be replenished with various items scarred across the city. Stamina is equally important, as it not only allows you to run and sprint, but also redefines how we look at climbing in games. Whenever you show off your acrobatic side it costs stamina, which will regenerate every time you take a breather on safe ground. Once your stamina bar empties out, you can continue running or climbing a little further by mashing the trigger, but doing so will quickly reduce the maximum size of your stamina bar. 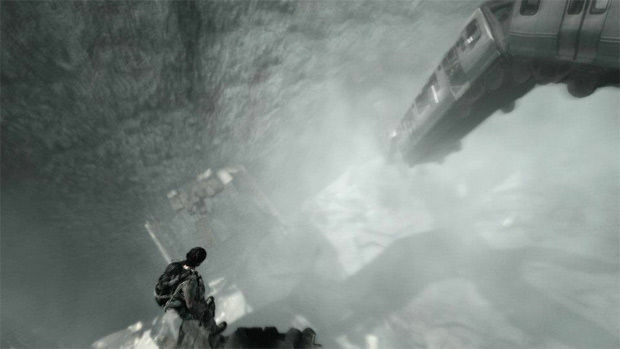 Performing jumps while climbing will take a large cut out of your stamina bar, rendering it a calculated necessity rather than the shortcut such a maneuver offers in games like Uncharted or Assassin's Creed. Since the size of your stamina bar translates directly to how far you can climb, it becomes imperative to plan how you want to approach a climbing endeavor and to spot places where you can stand to recover ahead of time. Most of the time such paths will be clearly indicated to push the player forwards without getting stuck. Sometimes, however, there is simply no place to recover as you go off the beaten path to scale large buildings or climb to those hard-to-reach places that are most likely to offer precious items. Pivots can be found and utilized to create a resting place on a walls where you can recover when there is no safe place in sight, but these are too rare to rely on throughout the game. You just have to be smart. Much has been said about the way I Am Alive handles enemy encounters. 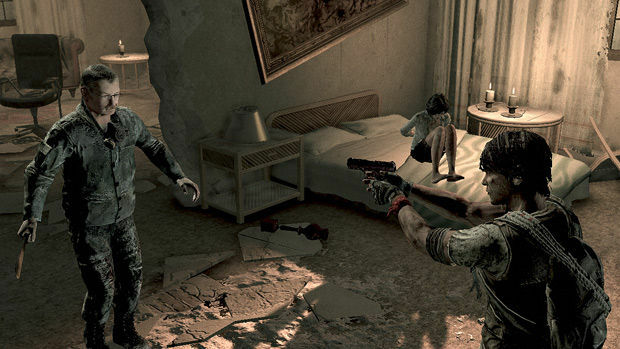 The game attempts to portray a moral conundrum by letting you perceive each non-player character as a human first, and a potential enemy of variable threat second. Sometimes armed civilians will instinctively threaten you in to protect their food or territory, and they'll allow you to slowly walk around without bothering them if you don't want to kill them for no good reason. Gangs, however, are another matter entirely. Increasingly large gangs will obstruct your progress. Their members are always male; women are reduced to victims after The Event. Armed with only a machete, a gun, and later a bow, you are usually not in any position to fight your way out of an engagement as in a typical third-person action-adventure. Obnoxious gang members can wield guns themselves, which forces you to think about your tactics. It's never wise to bring a knife to a gun-fight, after all. Thankfully, I Am Alive offers ways to turn any enemy encounter into a tactical puzzle. A surprise kill with your machete can take out whoever thinks you are an easy target who likes to be pushed around. Whip out your gun immediately afterwards, and anyone who doesn't have a gun to fire back will raise their hands and heed your orders to back off -- for a while. This leads to a lot of fun encounters, because you can tell gang members to back off until they are at the edge of a cliff or a fire, and then kick them into it like a regular Leon Kennedy or Chris Redfield. Aim at gang members for too long without taking action, however, and they'll call your bluff and attack. There's also an option to take down someone in a direct melee confrontation, but this requires a bit of mashing the right trigger to push your machete into their fleshy bits, and it completely leaves you open to other enemies. Some gang members will have more dominant personalities than others, too, which means you can kill the "leaders" and make the weak followers drop to their knees so you can knock them out. The combat system is unique, and works well as long as you execute it the right way. You'll quickly learn to take out gun-wielding thugs with a surprise kill right off the bat, then kick whoever is left to their death if the environment allows for it. Because bullets are very hard to come by, you'll start to rely on your bow as soon as you get it. An arrow can be shot and then recovered, meaning you can line up a group of gang members, shoot the nearest one with your bow, pick up the arrow as you keep foes away at gunpoint, and repeat the process until you are in the clear again. What is a rather big omission is the complete lack of a non-violent solution. Unless gang members completely submit to your dominance by kneeling down, they will run after you and try to kill you the moment you lower your gun. It results in some ridiculous situations where some bad guys, who obviously would rather just run away if given the choice, are stuck in their encounter with you and will tell you they'll leave you alone, but won't. You are forced to kill them unless you want to get a machete in your back, and upon death they will sometimes ask you with their last breath, "Why did you have to kill me?" Well, because you didn't have the AI routine to flee, that's why. This forces you to resort to violence in order to get past aggressive groups of enemies that obstruct you (i.e., the vast majority), and the lack of a penalty for killing them eliminates any moral compass the game carefully tries to construct. What makes this omission so striking is the way I Am Alive tries to make you ponder about your humanity in all other areas of the game. 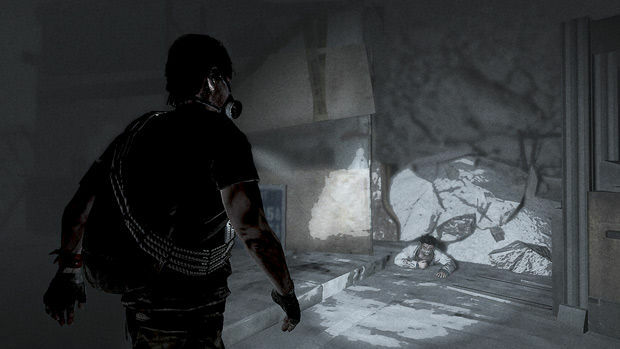 You'll come across friendly survivors in need who will usually require a valuable item in order to "survive." In return, they tell you a little bit about what happened in Haventon during The Event, and perhaps drop a hint about where you might find your wife and daughter. But even though this makes you feel like the good guy if you help them out -- and it does so very effectively -- you'll find an ever-growing hole in your heart as you drain the life of a hundred thugs who may have just been in the wrong company. The AI's predictable patterns and its insistence on suicide-by-survivor turn what could've been an intriguing sense of moral ambiguity and pondering into something else. Something that is about as carefully constructed as a LEGO base built by a blind person, without fingers, who also happens to lack any form of tactile sensory perception. Another way I Am Alive is at risk of ruining its own immersive qualities is in its approach to checkpoints. The game is cut into episodes, and every death will cost you a "retry" -- an item you can also collect in the world -- which puts you back at the latest checkpoint. Run out of retries, and it's back to the start of the last episode. While the episodes aren't that long, the prospect of running out of retries later in the game is always in the back of your mind, hovering above you like the sword of Damocles. An encounter with a gang can easily go wrong if you make a mistake, costing you health items, too much ammo, or a retry if you die. 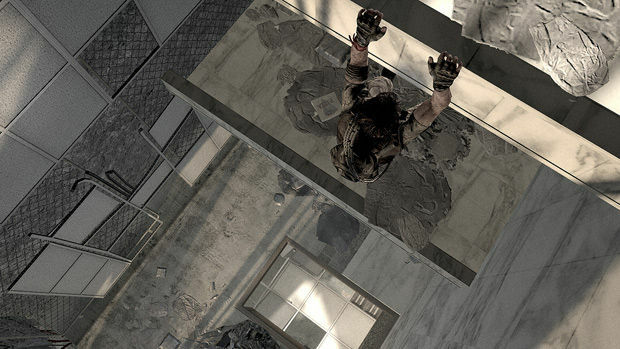 It becomes a habit to just return to the start of the current episode if you waste more than two bullets or retries within the first 15 minutes, especially since you'll encounter a couple of trial-and-error sections where an enemy appears out of nowhere behind you, or a platform suddenly gives way and drops you to your death. Sometimes a death also sends you back to a disorienting checkpoint where you have no idea if you had already explored other levels of a structure, or what items you had or hadn't picked up. Such checkpoints can make restarting the episode just as effective as backtracking, just to make sure you grabbed everything you could. As much as you'll be tempted to hoard retries, you'll never run out on "Normal" difficulty setting as you are given a minimum of three retries whenever you reach a save point. "Survivor" difficulty on the other hand makes you work for every retry by finding them in the world or by helping survivors. If you start out on Normal, which is highly recommended to get a feel for the city and mechanics, then don't think too much about the retries and you'll stay more connected to the engrossing world it has to offer. While the AI can be dumb and the checkpoints can occasionally be punishing, they never ruin what I Am Alive does right: it can completely draw you in and make you forget you are playing a game. The story of The Event is told as much by the visual narrative along your trek through the devastated cityscape as by its inhabitants. A thick haze of dust and ash increasingly limits your vision as you delve deeper into Haventon, hampering stamina regeneration and forcing you to either plan for short trips outside, or save enough stamina to periodically climb above the deadly cloud. Every time you start to run out of stamina, a panic-inducing orchestra will rise to a crescendo as you frantically clutch your controller to find a safe spot. It turns every long climbing expedition into an incredibly tense affair, rather than simple button mashing. Moreover, the entire atmosphere of Haventon -- and your encounters with both the city and The Event's few friendly survivors -- lets you connect to some level of innate humanity the longer you play I Am Alive; each time you kill someone by mistake, you will actually feel bad. It's just a shame that part of this effect goes to waste, since you end up killing so many people who are judged to be "bad" by the game that you end up feeling like a version of Judge Dredd who happens to be compassionate when he's off-duty. On the upside, you get to shoot arrows at the crotches of enemies in body armor, which goes a long way toward delivering satisfaction in any game. Despite the times you'll roll your eyes while patiently and carefully going through I Am Alive, you'll never stop being spellbound by it. It's not a short game by any means, clocking at an average 6-7 hours without finding all the survivors (and not counting a few hours' worth of reloading episodes). 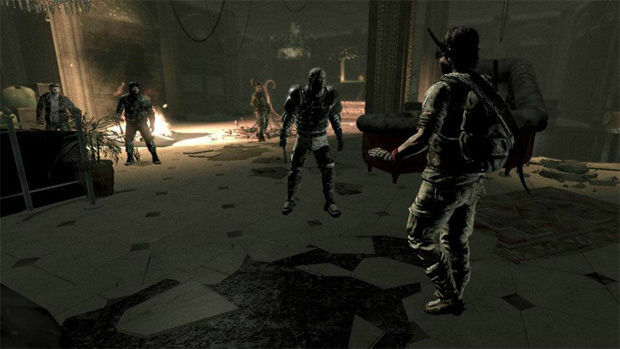 Once you've finished the expertly paced adventure on Normal difficulty, though, you'll almost instantly jump straight into Survivor mode, with its sparser retries, items, and ammunition drops, if only to find and help all the survivors and try to improve on your score. The ending will likely be a topic for discussion, too, as it hovers between being ballsy and a clear opening for future DLC. Hopefully, it will be the former and not the latter. As a downloadable title, I Am Alive is a remarkable accomplishment. Not only does it create an atmospheric world that feels real enough to identify with, but it succeeds at delivering a unique experience geared towards an adult audience while simultaneously being a fun game to play. It's a roller coaster of emotions, sometimes not exactly the ones the game intended you to feel, but a hell of a ride nonetheless.